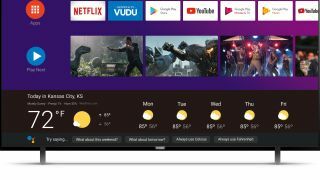 After years of using its proprietary NetTV platform and a small foray into Roku TV, two new 2019 Philips TVs will offer Android TV with Google Assistant, according to Funai, the rights holder of the Philips brand here in the US. The two series, the 5704 and 5904, will be available in five screen sizes ranging from 43- to 75-inches and will be on display next week at CES 2019. While Android TV is already a pretty big enhancement over Funai’s old NetTV platform - as it brings Chromecast Built-in functionality along with it - it’s Google Assistant that will imbue the TVs with the ability to talk to Philips Hue, Nest thermostat and other Google Assistant compatible products. As for the screens themselves, Funai says they'll come equipped with HDR10 support and Bright Pro, a backlight boost that brightens the image by up to ten percent compared to standard LED displays. More interestingly, the 5904 series will offer an integrated far-field microphone solution allowing users to access Assistant anywhere in the room. So when will you be able to get your hands on the new-and-improved Philips TVs? The 5704 will be available starting today in some club stores throughout the US, while the 5904 will be available in the second half of 2019.